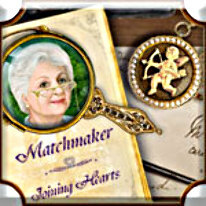 Step into the shoes of a matchmaker, and help singles find love in Matchmaker: Joining Hearts! Search over 40 unique hidden object scenes to gather clues about 10 single people who are looking for love. Can you compile the clues to arrange love matches between compatible people? If all goes well, your creative suggestions will be in demand as the singles need advice on everything from gift ideas to creating an unforgettable first date. Keep romance in the air, and prove that you're the ultimate matchmaker!